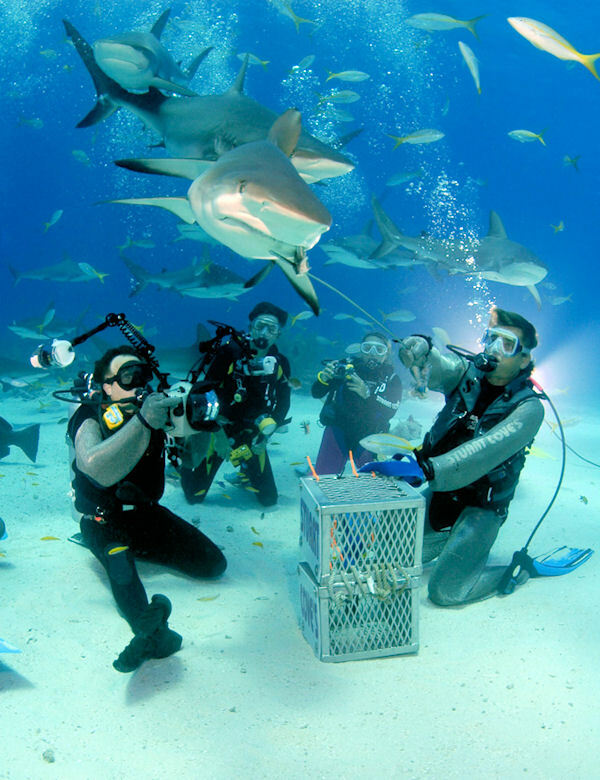 This 2-tank dive program introduces thrill seeking divers to wild sharks and provides you a close up look at these magnificent and misunderstood creatures. There are currently four sites where we dive with the sharks. You will dive either the combination of "Shark Wall" and "The Arena" or the combination of "Shark Wall North" and "The Runway." At either location you will encounter a gathering of Caribbean Reef Sharks on a consistent basis. Your first dive with the sharks is along a magnificent wall where the sharks swim calmly along with the divers in a non-feeding environment. Your second dive is on a large sand patch where the group kneels down in a semi-circle and watches our dive master feed the sharks off of a long pole. Dozens of 5-6 foot Caribbean Reef sharks swim amongst everyone and come within touching distance of all of the divers (although no touching is allowed!). A video and photos are taken of each dive, and are available to watch and purchase once we're back at the dive shop. Each person is required to wear a full wetsuit with long sleeves and legs. Dive equipment and wetsuits are not included - wetsuits are available for rent. Participants must be at least 12 years of age and in good physical health. You must be a certified diver. Divers who have not logged a dive within the last three years will be required to complete a refresher program prior to joining any scheduled dives. Children under the age of eighteen must participate with a parent or guardian. Children under the age of four are not permitted on the vessel.